When you know how to write a conclusion for your article, letter, or blog post – or any content, for that matter – you finish strong and make your point. You also make it worthwhile for your reader to stick with you until the end. It’s no secret that you need to write a strong opening to hook Joe Reader. When he gets interested, he proceeds to read or skim the body itself. That means half of your readers finish the piece! What if your Joe Reader is among the remaining 50%? By writing powerful endings, you give Joe an unexpected bonus. He doesn’t expect memorable or useful content at the end. How can you give it to him? Show Joe a bit of respect and finish quickly. 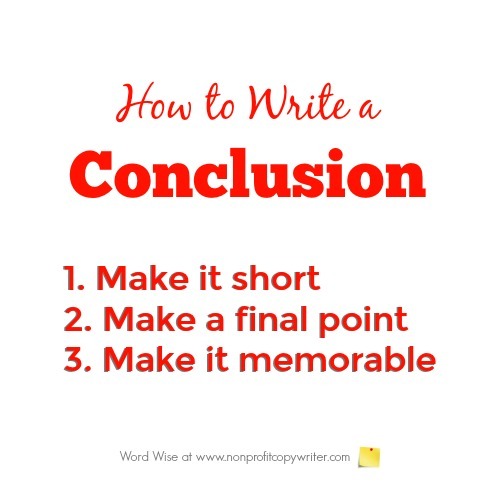 As a general rule, keep your ending to 10% of the piece’s total word count. The weakest endings are a straight-up rehash of the content’s main point, either by using the same language or the same angle. A strong ending goes one step beyond the main point you made in the lead when you set out the problem. Then you unpacked it with reasons why. Now is the time to add, amplify, or expand on the promise you made in the opening. By consistently writing powerful endings, you surprise Joe Reader in a good way. You earn his trust because you give him more than he anticipated. It’s what marketers sometimes call “over-delivering.” Your point sticks with him. Do it often enough and Joe Reader looks forward to finishing your content because now, he expects to find a jewel. An ending is not just a throwaway. It’s a takeaway. Content Writing: What Is It? What is Free Content and Why Should I Offer It?